You have 10 kids to feed. You got 2 jobs but you still don't earn enough to feed all your children. So you have to go to the nearest jungle to get some bananas for you and your kids. 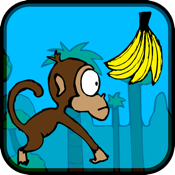 Stay on the branches and collect as many bananas as you can!